Coca-Cola has launched a follow up to its wildly successful ‘Share a Coke’ campaign with a Spotify integration in a bid to tap into the emotion linked with music. The campaign, created in conjunction with Universal Music and Spotify, aims to to help Australians relive special moments in their lives and reconnect with friends and family by encouraging them to share songs unlocked by QR codes or URLs printed on products. Running until December, ‘Share a Coke and a Song’ will see consumers who activate the QR codes and URL directed to a mobile site where they can share the songs with their friends on their smartphones or into the Spotify desktop program to listen to and share the songs from their PC. The packaging of selected bottles and cans of Coke, Diet Coke and Coke Zero will feature a year from 1938 to 2012. By scanning the QR code or visiting the URL code on the COKE pack, consumers will unlock 50 popular songs associated with the year printed on the bottle. Years are being printed and distributed on products at random, but Austin says there will be an era of relevance for most people on the shelves, including the campaign’s core target market of young adults. Advertising supporting the campaign within Spotify will kick off on 29 September encouraging users to engage in the campaign. While Coca-Cola counts Spotify as a global partner, this campaign marks the first time the brand has advertised locally on the music streaming service. The original ‘Share a Coke’ campaign which launched last summer across digital, social, outdoor and TV saw people’s names printed on Coke bottles and cans, as well as the iconic Coke billboard in Sydney’s King’s Cross. Young adult consumption increased significantly during the campaign, up by 7%, making 2011 the most successful summer ever for the brand. The campaign earned a total of 18,300,000-plus media impressions, boosted traffic to Coke’s Facebook site increased by 870% and saw 378,000 custom Coke cans were printed at local Westfield malls across the country. 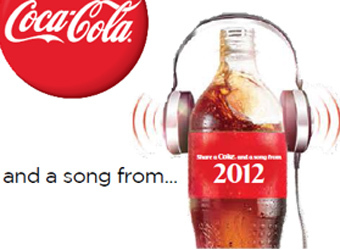 Read: Marketing‘s case study on the success of 2011’s Share a Coke campaign.